Let's face it... a lot of times people go to the gym to workout, but they lack the knowledge of training properly to get the most benefit out of their workouts. They may do a few lifts they've done for a while, or that they've seen others do, but truth is, they may not be doing things in the most effective way to see the results they want. The specific order and flow of your lifts, the number of sets, the number of reps, the amount of rest between sets.... it all factors in when it comes to training properly towards a specific goal. 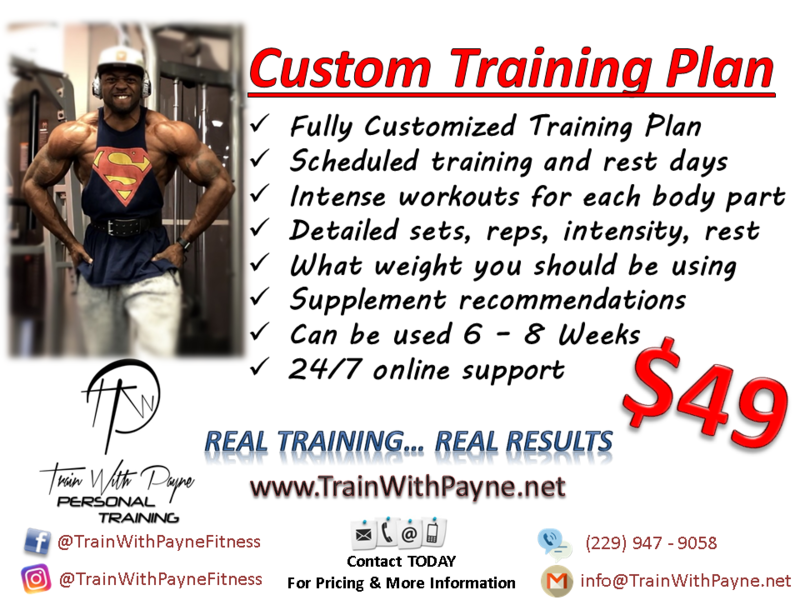 That's where Train With Payne workouts come in! We'll take the thinking out of your routine so that you could focus on working hard, and getting results. We'll design workouts for each specific body part that incorporates training styles and routines based on what you're trying to accomplish. No matter if you're looking to bring up a lagging body part, get stronger in a specific area, or just develop a balanced, well rounded physique, we have the perfect workout for you! All you have to do is get to your gym, and follow the program! Sounds good? Each workout comes with 2 routines so you could hit that specific muscle group up to 2x per week. We'd recommend sticking with the routine over the course of 4 -6 weeks, aiming to get stronger on each lift, every week. TWP’s Workouts will help you to…. Develop weaker/lagging, or favorite body parts. Correct imbalances in muscle groups. Have structure in your training sessions. Add the needed intensity to your training. Focus on training, and not trying to figure out what to do.